The Good Wolf or the Bad Wolf? There’s an age-old Native American story about the battle between the bad wolf and the good wolf inside each of us. A grandfather tells his grandson that the bad wolf feels sorry for itself. It is also angry, proud, greedy, dishonest, and feels guilty and inferior. The good wolf, on the other hand, is loving, peaceful, hopeful, joyful, kind, shows empathy, speaks the truth, and has compassion for others. The story of the wolves and the analogy of a person’s mind being like a garden have one thing in common: the thinking patterns we choose to cultivate are the ones that will manifest in our lives, whether we want it that way or not. Maybe you realize that you’re damaging your career or your relationships because you don’t manage your time well. You know you have to plan better, and then stick to your plan. But some people aren’t prepared to put in the “hard yards” to become successful. They know they have to push through the pain of doing what must be done, but, instead, they choose to do what’s comfortable. If there’s something in your life that you want to change, why do you do the opposite? What makes this self-sabotaging behavior even more confusing is that you experience “bad wolf” emotions as a result: you can feel resentful, inferior, self-pitying, sorrowful, regretful, guilty, and maybe even envious of others. There are many reasons for self-sabotaging, but erroneous belief systems play a significant role. What you believe about yourself and your abilities is like a GPS in your mind that will steer you toward the outcome of your beliefs. If you want to stop self-sabotaging, you need to give your internal GPS new coordinates. But changing your beliefs about yourself, and about what you think you can attain, is a one-person sport. You, and only you, can change your beliefs. By all means, research and get all the advice that you can, but you are responsible for doing the work. During our #MTtalk Twitter chat last week, we talked about busting self-sabotaging behavior. Here are the questions we asked during the chat, and a selection of the responses. Q1 In what ways do you self-sabotage? @Mphete_Kwetli: Never give yourself chance to flourish & challenge your efforts. @NWarind: By letting fear get into your mind. Q2 How might you self-sabotage when it comes to controlling your time? Chances are, we could all improve our time management skills a little. For example, we could be better at minimizing distractions or at beating procrastination. @WonderPix: Sometimes, “shiny object syndrome” takes over and keeps us from doing things we need to do. @70mq: Spending too much time on one thing. A good break helps so much. @smrtang: Doing a bunch of little non-priority tasks before attacking the big one. @GenePetrovLMC: Scheduling way too many things. Even when I know I can’t possibly fit them all in. Q3 What are some of the tasks or decisions you typically procrastinate over? @Ryan5977: Tasks that lack clarity, perhaps when the value in them is not clear. @MicheleDD_MT: I put off having a difficult conversation with someone when I know that the person will get defensive or angry. @JoynicoleM: That which is uncomfortable, unexpected, unknown. Sadly, you spend more energy in the self-talk than you do just getting it done. Q4 What excuses do you make that prevent you from doing tasks? We saw the two best labor-saving devices ever invented – “later” and “tomorrow” – rear their ugly heads. There were some other interesting excuses, too. @PG_pmp: Brick wall within self that stops me from going ahead & starts giving me excuses. @BrainBlenderTec: I’m out of time or they aren’t due yet. @TwisterKW: There will be a better time. I don’t want to disturb Person X. I’ll give them one more day to get back to me. Let me look this over one more time before submitting this draft. Q5 What causes your self-sabotaging behavior? How do you know? @JKatzaman: Getting comfortable helps you self-sabotage, especially if there are no immediate repercussions for inaction. @SaifuRizvi: We don’t love what we do, and lack of commitment becomes a reason behind our self-sabotaging behavior. Q6 What emotions do you experience when you procrastinate, or when you insist on doing everything yourself? @harrisonia: After procrastinating, I initially feel relief for the brief reprieve, but later I feel the downward spiral of regret. Q7 What would motivate you to stop self-sabotaging? @KobusNeethInst: If you realize how much self-sabotaging hurts your creativity and creative thinking ability, you’d stop doing it NOW. @JusChas: I think accepting the fact that it is normal to be imperfect. That obsession with perfection will be the death of you if you allow it. Q8 Which beliefs do you need to change to help you to stop self-sabotaging? @sittingpretty61: Fear of failure and knowing that I can do it, if I stress finding the solution rather than just a preliminary answer. I can’t find handicap parking when I go to aquatics, now what? Use disabled transportation! @jeremypmurphy: The false negative beliefs we hold about ourselves. Q9 What practical steps could you take to reduce those behaviors? @Yolande_MT: To stop self-sabotaging, you need to practice your willpower and your “won’t power.” Say yes to what serves you, say no to what doesn’t serve you. @SailorsBen: Simply make the choice to do things that scare me and see them through. Rarely is anything as difficult as we thought once we start and and ask for the insights, wisdom, and knowledge of those who have also walked that path. Q10 In what ways might your changed behavior improve your relationships at work, at home, and with yourself? @JKatzaman: When you stop self-sabotaging, you’ll look on family, friends and coworkers more kindly, with a whole lot of tension removed. @PG_pmp: People start sharing moments, empower each other, appreciate each other’s strength. To read all the tweets, see the Storify summary, here. Choosing not to see things that we know are there is a very dangerous form of self-sabotage. Margaret Heffernan, the author of “Wilful Blindness,” says that the biggest threats are the ones that we don’t see: not because they’re hidden, but because we choose not to see them. 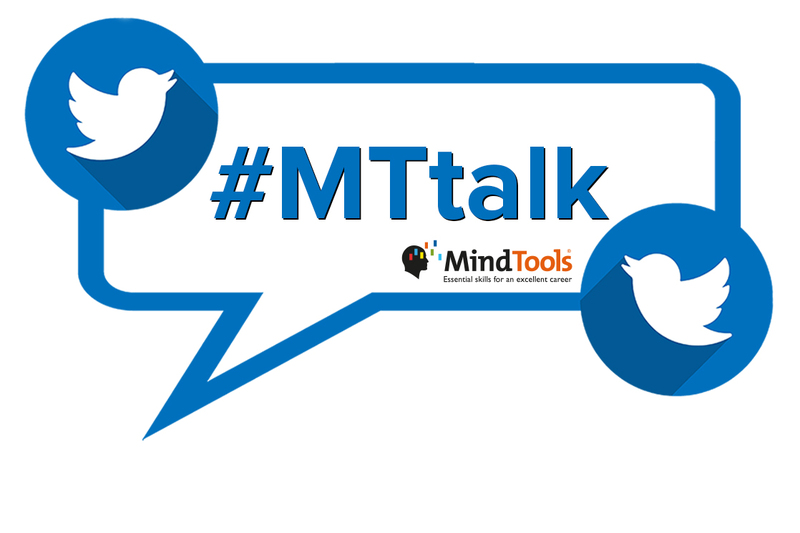 The topic for our next #MTtalk chat, on March 30, is “The Dangers of Willful Blindness.” What kind of willful blindness have you experienced in the workplace? What do people most often choose not to see? Click here to cast your vote. Free “Take Control of Your Time” Toolkit! Do you want to become an expert at managing your workload? Join the Mind Tools Club before midnight PST, Thursday, March 22, 2018, and get our “Take Control of Your Time” toolkit, absolutely FREE. This toolkit teaches you the core skills you need to manage your time effectively, to delegate and schedule work, and to banish bad habits, once and for all! So, join the Club today for just $1, and start taking control of your time and your career! Love this wrap-up article. Could you provide a way to print them? Thank you. Although our articles are designed to be read online (computer or mobile devices), you can still print them using the ‘file > print’ option from your browser.